RIDGID® Traditional and Close Quarter crimp tools are the right choices for ASTM F1807 fittings. RIDGID Traditional PEX Crimp Tools are available from 1/2" to 1" and are ideal for making PEX tubing connections in potable water and radiant heating applications. Over 20% lighter than other traditional-style crimp tools, these tools feature E3 ergonomic handles and come standard with a Go/No-Go gauge. 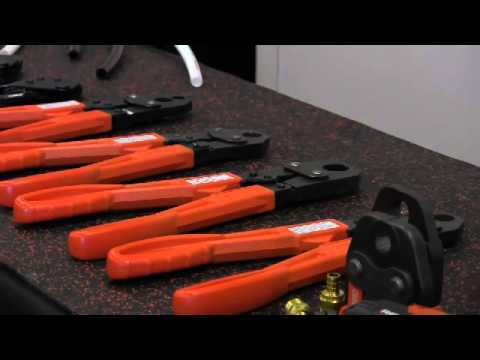 Close Quarters Manual PEX Crimp Tools are the newest addition to the RIDGID Crimp Tool line. With handle openings up to 71% smaller than traditional PEX crimp tools, you can maneuver into tight spaces with ease. You’ll always be prepared with a built-in Go/No-Go gauge – an exclusive feature with RIDGID crimp tools. For use with ASTM F1807 black copper crimp ring system for PEX tubing. Over 20% lighter than traditional PEX crimp tools. Up To 33% less force required to produce a crimp, compared to traditional PEX crimp tools. Compact tool length for access to tight spaces. Four tools available in (3) sizes: 1⁄2", 3⁄4", 1" and a Combo 1⁄2" and 3⁄4" Tool. Easily adjustable lock screw for tool calibration. All tools come with a Go/No-Go gauge. For use with ASTM F1807 copper crimp ring PEX tubing connections. Durable, glass-filled polycarbonate E3™ (Expert Engineered Ergonomics) handles provide increased comfort. Available in ½” and ¾” sizes. Easily adjustable cam for tool calibration. Integrated Go/No-Go Gauge folds into handle for easy storage. ASTM F 1807 PEX Crimp Tools is rated 5.0 out of 5 by 1. Rated 5 out of 5 by danger from I use the close Quarter crimpers all the time, love the all steal construction on this model.. Now I can PEX the heck out of a house faster! Thanks Ridgid.